Help us continue our work and read or buy one of our books. HardVery long second day. Good tramping and route finding skills required. No easy escape in case of bad weather. 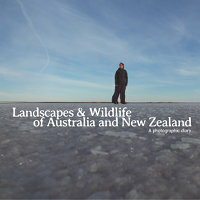 This epic adventure takes you along the tops of Bealey Spur, down Jordan Saddle and to the Waimakariri River following Jordan Stream. 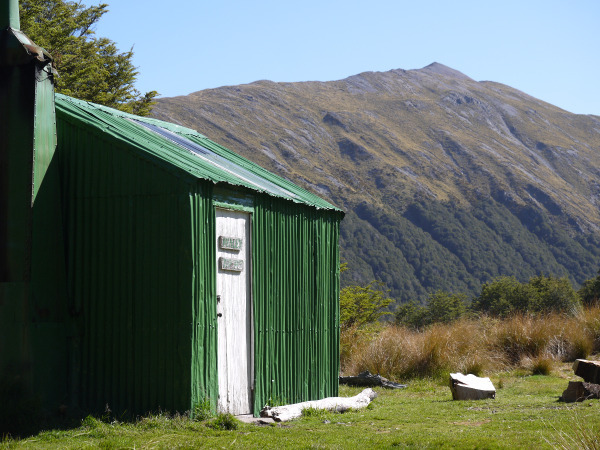 In that journey you will pass an historic 1935 musterer hut, walk on a spectacular ridge up to 1,875 metres, with 360° views on Arthur’s Pass and Southern Alps peaks, and climb down rocks in a mountain stream. A true tramping adventure, requiring fine weather, good tramping skills and the ability to find an unmarked route through the landscape. Public transport: the TranzAlpine train operates daily from Greymouth to Christchurch, stopping at Arthur Pass, less than 500 metres from the Visitor Centre. Intercity operates buses between Greymouth, Christchurch and Franz Josef too. The small village of Bealey is 13 km south east of Arthur’s Pass along the highway. Should be quick to hitch a ride in the summer tourist season, as there’s a good number of cars going through here. By car: the carpark is at the bottom of Bealey village, 13 km south east of Arthur’s Pass, on the highway. The carpark is clearly signed as Bealey Spur. Bicycle: if using the TranzAlpine train you might have to book your bike beforehand, as they are limited to four per train. You then have to cycle 13 km, mostly downhill, on a good highway. Cycling on the tramping track is not allowed. Best time to go: mid summer, January to March. Might be possible outside of that, but call Arthur’s Pass visitor centre to know how are the streams and if there is snow on tops. If there is snow on Avalanche Peak it is very likely that Hut Spur ridge will be impassable too. If there is snow or ice on the tops you will need crampons and ice axe. Costs: none, Bealey Spur Hut is free, and camping beside the hut is free too. 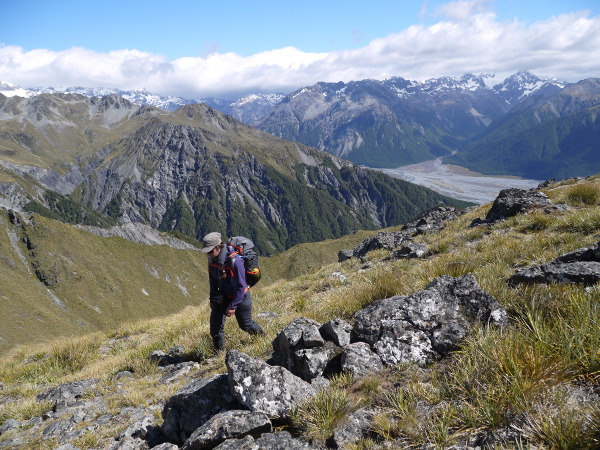 Time: this is a long hike, about 10-12 hours of walking, and the suggestion is to do most of the climbing on day one, by sleeping at Bealey Spur Hut (2-3 hours), making the second day slightly shorter. This could also be done as very long and tiring day walk, but if you don’t know the area it’s still best to carry some kind of shelter or tent if you are caugth in bad weather. Accommodation: Bealey Spur Hut is a small and rustic 6 bunks hut, it is cold and doesn’t have mattresses (bring your own). It is also sometimes popular and full, so you should always pack a tent. Easy/medium day walk option: 13 km, 5 hours, +900/-900 metres. Just go up to the first cairn on the ridge, at 1,525 metres, just before point 1545 on the map. Extensive 360° views can be had. This is a good option if you don’t have time. Plus you get to enjoy the best views while going down! 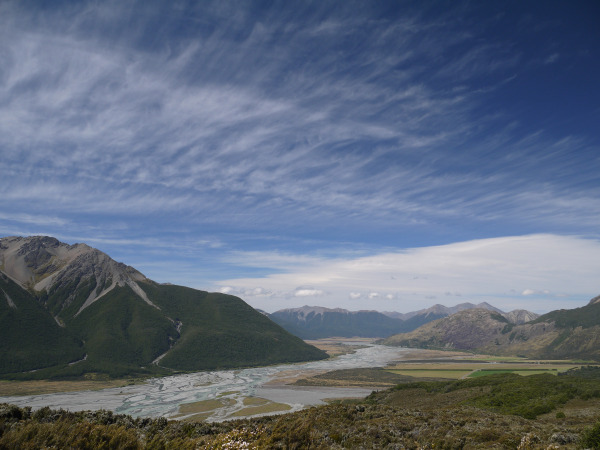 Even though the weather on this side of Arthur’s Pass is much better than on the West Coast, you should still check the weather forecast and the level of the Waimakariri river before going. This route requires fine weather. 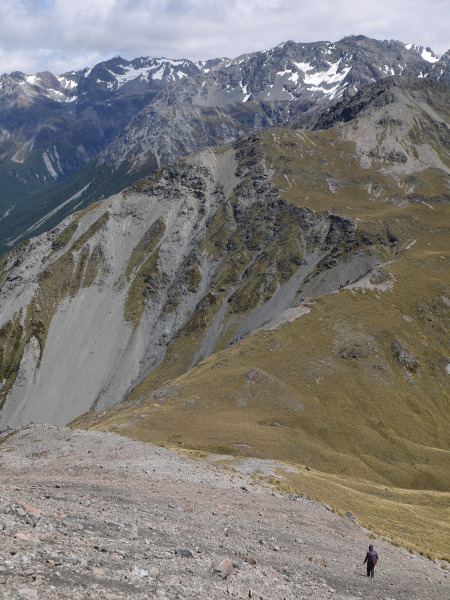 The Hut Spur ridge is exposed and high (1,545 metres to 1,875 metres). High winds, snow or heavy fog could prove dangerous. 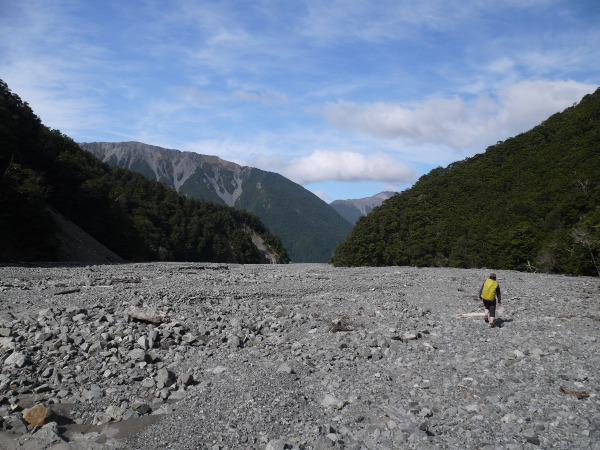 After or during heavy rain the descent down Jordan stream can become dangerous as it becomes a ferocious river, and some parts are narrow and may be subject to landslips. Definitely don’t go past Bealey Spur Hut if the weather is bad or if the ridge has snow, of if it has been raining heavily during the night! Travel on the ridge have some slightly exposed parts, with loose scree underfoot. It’s not very hard but you have to be cautious and take your time when going around or above obstacles. Don’t trust handholds and footholds too much as the rock is often flaky and can easily snap. You also need a GPS, or map and compass, and know how to use them. There is no easy escape route from this circuit, and no sheltered spot to camp if the weather turns bad. Don’t try to go down Little Jordan stream as there is an impassable waterfall down there. There is no water on the ridge between Bealey Hut and the start of Jordan Stream. The first step from the carpark is to ascend the road through the village to the start of the actual track, a 500 metres walk on bitumen. There is a sign and a long drop toilet at the start of the track. 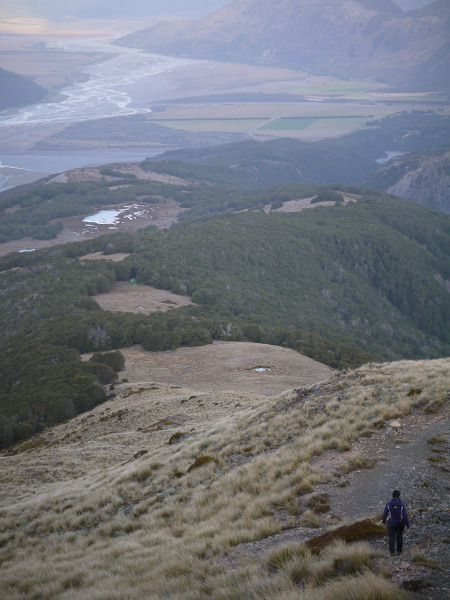 You then follow a good track between beautiful patches of beech forest and mountain tussock. Sometimes the track is slightly muddy but you can usually keep your feet dry. 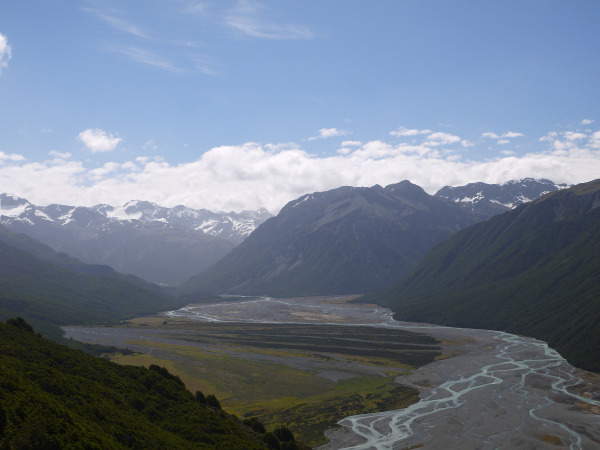 There is a number of good views to be had along the track on to the Waimak river valley and numerous branches, as well as on the Southern Alps snowy peaks. Most days a thick layer of clouds can be seen behind the mountains, telling you that you are on the right side of the Alps. 1.5 hours and a 400 metres climb after the carpark you reach a large boggy flat with a couple of beautiful tarns, where a nice board walk keeps you from getting your feet wet. 30 minutes later you reach the hut, at the border of a quiet beech forest, with good campsites all around. There is a long drop toilet and a small rainwater tank behind the hut. You should put all your food in a bag and suspend it from a nail somewhere, as mice and rats are very active in this hut. If you still have energy you can follow the well defined track to the first cairn on the ridge (at a height of 1,525 metres) for a nice sunset view of the mountains (if the weather is clear). If the weather is fine, an early start can reward you with wonderful views of the surrounding mountains and valleys at sunrise. That’s if you are ready to wake up early after a night of barely sleeping, feeling mice running around your head all night long! Follow the well-defined track up from the hut through boggy and wet tussock, bordering beech forest, until you reach the first cairn of the Hut Spur ridge, at 1,525 metres, just short of the 1,545 point on the map, where another cairn awaits you. This is where you have to stop and backtrack if you just want an easy day walk. From there following the ridge is easy, but is slow as you have to negotiate some slightly hairy sections, where you have to go around some rocks, walking on loose scree, above steep slopes. So take your time and be careful. There is no complicated rock climbing here, just some scrambling here and there, and most obstacles can be bypassed by going either to the right or the left. There is one tedious climb on loose scree before point 1794 on the map, but it’s not too exposed, just tiring. If a strong wind gust comes and feel you might lose your balance, drop to the ground on all four until it passes. Happily you are rewarded by wonderful views all around you! After a good while you finally reach the summit at point 1,875 metres. This is usually quite a windy place, so you might want to drop down to the saddle for lunch. This is also the point where you can still turn back and backtrack to the hut if the weather turns foul. From the summit you should see Jordan Saddle a whole 400 metres below you. To reach it you need to go down on the steep loose scree slope. 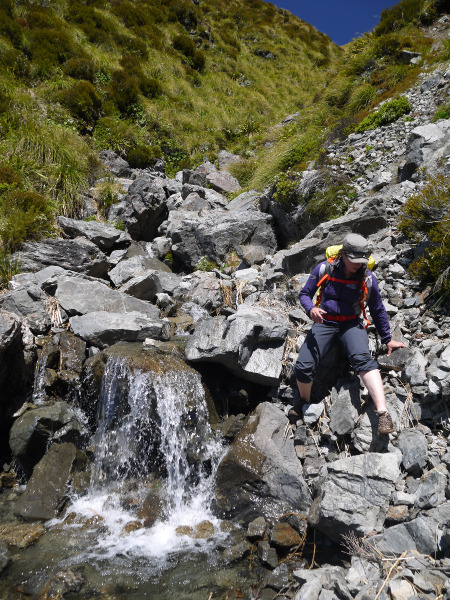 This is a fun part, but make sure you are going down towards Jordan Saddle and not down to Little Jordan Stream (which can’t be passed because of a waterfall), as going up that scree slope again would be quite a nightmare! After 20-30 minutes from the summit you should reach the saddle cairn, which also has a wooden pole. The saddle has good flat spots to pitch your tent, but it would be very exposed and windy. But they make good spots to have lunch, with wonderful views. 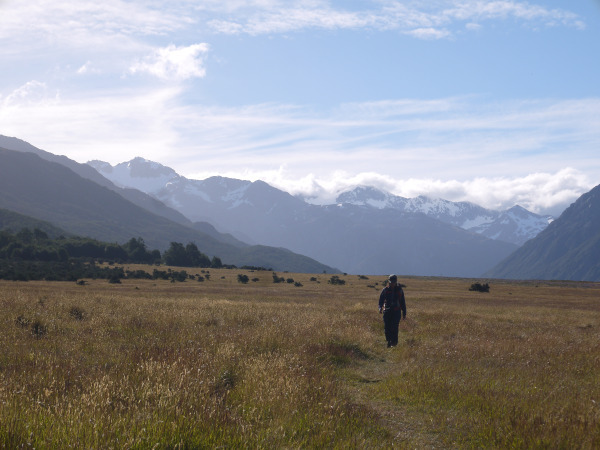 From the saddle follow the tussock flats North-North East to the headwaters of Jordan Stream. Soon there are three branches of Jordan stream joining together (not seen on the map). Don’t go down the middle one as there is an impassable waterfall. Once you have reached the stream you will need to climb down rocks, and cross the stream multiple times, don’t try to avoid wet feet at this point, as it would just take too much time and you will get wet feet later on either way. Be careful, even though rocks aren’t usually slippy. The stream will grow bigger as you meet other tributaries on both sides of the valley, and the stream bed will get less steep. The small brook is now a bubbling mountain stream, and you have to cross it again and again to avoid detours along bends. Then after 2 to 3 hours and a final “gorge” section where the riverbed narrows, it suddenly widens to a very large glacial valley, where you don’t have to rock hop anymore and the walking will be quicker. Stay on the true right bank until the valley widens again at Turkey Flat to join the Waimak river at a nicely made cairn. You can see the Waimak branches further away, but you’re not there yet! Turn right onto river flats at the cairn, going towards the Waimakariri river. After a while you should see white poles, representing the Waimakariri track, going to the right across extensive grassy flats. After those flats you cross a usually dry creek, and begin the last leg of the track in beech forest, soon climbing above the Waimak, crossing a number of side streams. You finally reach Waimakariri Track carpark, with a toilet and picnic table, just at the end of the highway bridge. From the bridge it is 3 km or 30-40 minutes along the road back to Bealey Spur carpark. Or you can hitch a ride. ... Or enjoy a swim in the river while your tramping partner is going to find the car. Just hope that he or she won’t leave without you!